The Abdominal Fat Reducer by Dr. Frank Ryan is just more marketing hype for another fat loss supplement. A full-page newspaper ad today screams it virtues. However, the science behind it is weak, at best. Let’s make this short and sweet. You or I could chase down loose ends for these kinds of products all day long, and we wouldn’t get anything else done in life. There is no end to them. This one caught my interest today, though, because of the full-page ad that appeared in the sports section of my local newspaper, the Arizona Republic. The title of the ad, in giant bold letters was, “Abdominal fat reducer provided to Hollywood stars by famous plastic surgeon now available to public.” The last time Dr. Ryan appeared in this newspaper was in a syndicated article about his death: Plastic surgeon to the stars killed in crash (August 17, 2010). Doesn’t it make you wonder how a famous Hollywood plastic surgeon ended up being the key celebrity name behind a fat loss supplement more than a year and a half after his death? I am sure the answer lies somewhere in the phrase, ‘follow the money’, as so many things do. However, what I want to dig into and tell you about is the product itself, the Abdominal Fat Reducer, and the people behind it. The product can be ordered through Endless Youth and Life, which is a marketing company owned by, of all things, Suarez Corporation Industries of North Canton, OH. One more interesting item is that the ad states that the study behind this supplement was commissioned by a research group with, “…an expert staff consisting of more than 32 board-certified physician investigators and more than 38 ACRP certified clinical research coordinators.” This sounds impressive, although there was no easy way to find anything about who these people are. The Endless Youth and Life website lists 6 health experts, none of whom has has a background in clinical research. I am happy to say that making the report available to the public is very helpful, since it is not published in a scientific journal. By examining the report, I discovered that the sponsor of the study is listed as – surprise! – Suarez Corporation, Inc., of North Canton, OH. No authors are listed. However, the research group of investigators who commissioned the study – listed as Advanced Supplement Research – is located in Beverly Hills, CA, with a main contact person by the name Rehan Jalali. This is also one of the two main contacts for Suarez Corporation, Inc., of North Canton, OH, listed on the report. The report did not offer background research from the scientific literature (i.e., no Bibliography or Literature Cited), any introductory comments on why the formula of the product was designed to contain specific ingredients, nor any discussion of results for comparison with other studies. Subjects took 2 softgels twice daily with meals, with at least 10 oz of water, for 8 weeks. I love statistics as much as the next person, I really do. The results included an overwhelming amount of statistics – the report was 57 pages long! A lot of the statistical discussion was too elementary for scientific purposes, or too technical for the public. The study kept track of several health parameters. 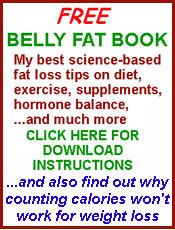 This is a key result, since the real target of any kind of weight loss result is body fat. This table contains lots of stats, so I’ve added a red arrow to highlight its main point. The claim ‘5-times reduction in fat mass’ appears to be accurate. After 8 weeks, Abgone ES gave a fat mass change of -1.41 kg (3.1 lbs) and the placebo gave a fat mass change of -0.28 kg (0.6 lbs). Why at week 4 and not at the end of the study? This is an interesting puzzle, isn’t it? The difference at week 4 (0.48 vs. 0.13; see red arrow) does, indeed, represent a 4-times reduction in BMI. And the difference at 8 weeks (0.56 vs. 0.44, see blue arrow) is very small. Actually, the lack of statistical significance at either point fails to support a suggestion that AES does anything at all to change BMI. Now we should be getting somewhere. The advertised claim is ‘4-times greater weight loss at Week 4’. The same comments apply here as with the graph for changes in BMI above. The data show a difference loss of 1.39 kg (AES) vs. 0.38 kg (placebo) at week 4 (red arrow) and a loss of 1.6 kg (AES) vs. 1.2 kg (placebo) at week 8 (blue arrow). Note that the maximum mean loss of 1.6 kg is only 3.5 lbs. Even if this was statistically significant, which it isn’t, this is a pretty small weight loss for 8 weeks. The red arrow shows the reduction in waist circumference of 5.7 cm (2.2 inches) with AES (red arrow) and of 3.4 cm (1.3 inches) with placebo. This may be the best result of them all, because the change over 8 weeks in the AES group is statistically significant from baseline (i.e., from the beginning of the study). However, what we really want to know here is whether the change in the AES group is statistically significant in comparison with the change in the placebo group. Unfortunately, even though a reduction of 5.7 cm vs. 3.4 cm is nearly double, there is no statistical analysis that compares them. This is a very simple statistical test that the report does not provide. I see nothing really wrong with this product, although the science behind it is weak. The ingredients do not warrant the expense ($39 on the website or with the ‘limited time’ coupon in the newspaper ad). CLA, green tea extract, and branched-chain amino acids (L-Leucine, L-Isoleucine, L-Valine) all offer individual benefits for weight/fat management based on scientific research. All of these ingredients are readily available in nutrition stores at excellent prices. They are not expensive unless they are enhanced in some way (e.g., regarding green tea extracts, see Boosting Green Tea Weight Loss). I will post the research on these ingredients individually in upcoming articles. Meanwhile, I simply recommend that you experiment with one at a time, for a period of at least 90 days, to see how they might help you. You can, of course, order the AES product (aka, Abdominal Fat Reducer) if you wish. However, I am not convinced that it is worth the price.